This strategic plan responds to the challenges and opportunities we face. Specifically, affordable homes remain out of reach for too many Washingtonians, particularly those with the lowest incomes. It sets a course for our ongoing public policy advocacy, calls out our commitment to undoing institutionalized oppression, and establishes strategies for sustaining our work for the long-term. 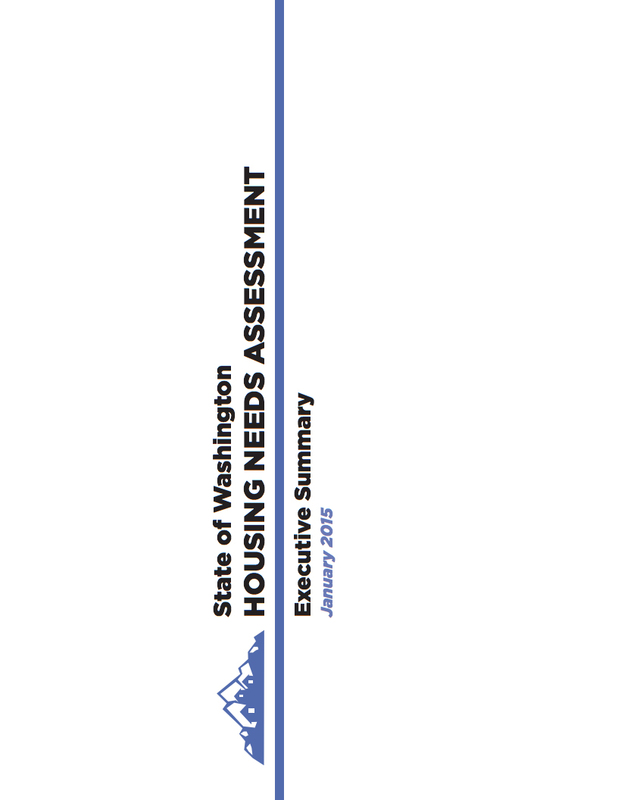 The purpose of this report is to provide an annual snapshot of the state of affordable housing and homelessness in Washington. The report compares data on homelessness, housing costs, and income needed to rent or purchase an average-priced home. The most recent data is compared with data from one year and five years prior. 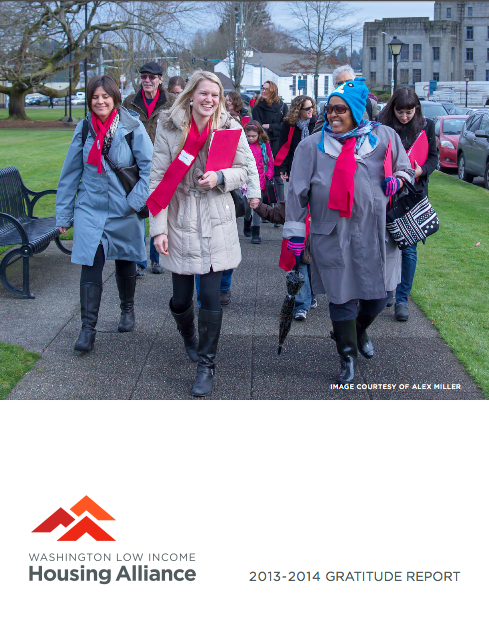 The report also highlights the impact of affordable homes on families and individuals and is complemented by a series of fact sheets that provide local data and a personal story for communities across Washington. With support from the Washington State Department of Commerce and the Washington Housing Finance Commission, the Housing Alliance has developed a data-storytelling page for each legislative district. The purpose is to highlight the story of one constituent in each district alongside recent data about housing and homelessness unique to that area for the purposes of advocacy. View and download the story pages by district. We advocate for public policy supporting our vision that all Washington residents have the opportunity for safe, healthy, affordable homes in thriving communities. This document contains our 2017 Affordable Housing and Homelssness priorities, along with our newly introduced support issues. The Housing Trust Fund is funded through the Capital Budget and investments are allocated on a competitive basis to non-profits and public housing authorities on a competitive basis. Homes created by the Housing Trust Fund remain affordable for at least 40 years, and provide homes for families, seniors, veterans, people with disabilities, farmworker, and others. A modest fee paid to file real estate related documents provides Washington's most important source of funding to combat homelessness. The fees fund domestic violence shelters, youth shelters, outreach services, short- and long-term rental assistance, move-in assistance, permanent supportive housing services, and more. No one should be denied a home just because they use a housing voucher, social security, child support, or some other form of legal income support to help pay the rent. But in most places in Washington, landlords can categorically deny applicants from tenants simply for using these methods of payment. Services that allow people to weather a short or long-term disability can meant the difference between living in a safe and healthy home, or homelessness. 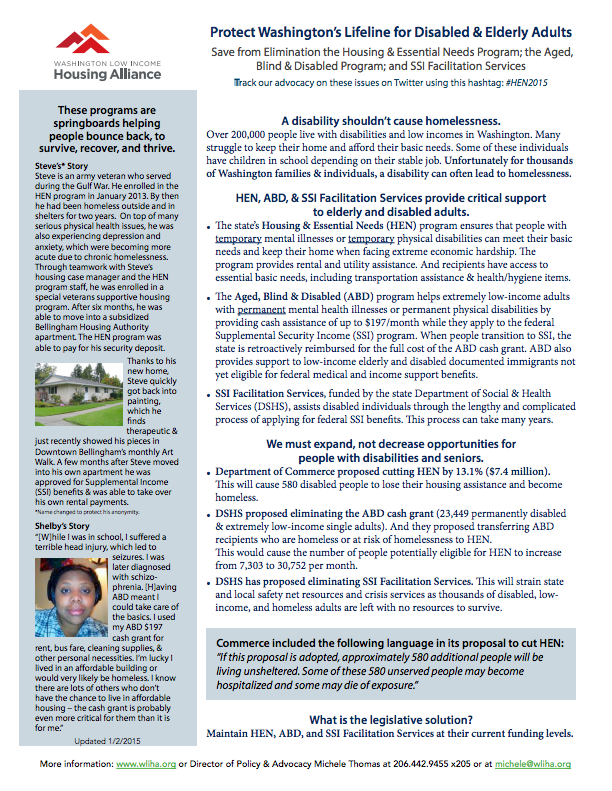 The Housing and Essential Needs Program, Aged, Blind, and Disabled Program, Medical Care Services, and SSI Facilitation Services, are critical lifelines for Washington's disabled and elderly adults. We advocate for public policy supporting our vision that all Washington residents have the opportunity for safe, healthy, affordable homes in thriving communities. This document contains the complete list of our 2016 state legislative lead items. The Housing Trust Fund allocates state funds on a competitive basis to create affordable homes. Most people living in these homes are extremely low-income and include people with disabilities, seniors, families with children and more. An additional investment of $10 million in the 2016 Supplemental Capital Budget will help create a biennial total of 2,400 newly affordable homes. 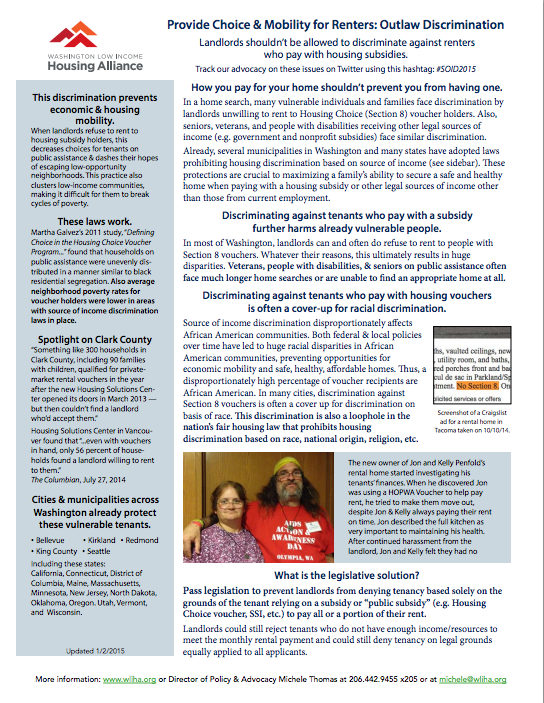 In a home search, many vulnerable individuals and families face discrimination by landlords unwilling to rent to Housing Choice (Section 8) voucher holders. Seniors, veterans, and people with disabilities receiving other legal sources of income (e.g. government and nonprofit subsidies) face similar discrimination. Over 200,000 people in Washington have a disability and are low-income. Many struggle to keep their home and address their most basic needs. These programs are a last resort safety net for people who are unable to work and who are otherwise at extreme risk of suffereing poor health and even death. Rental supply analysis, including an inventory of publicly funded housing units in our state. Analysis of how much of the public portfolio is at risk to conversion to market-rate housing. Homeownership analysis including financing trends, mortgage rates, and foreclosures. Each year, we partner with the Washington State Finance Commission and the Washington State Department of Commerce to publish this affordable housing report that has significant statistics and information on affordable housing and homelessness by county, by region, and across the state. It is an informative dashboard that answers most questions you have about homelessness and affordable housing in our state. We advocate for public policy supporting our vision that all Washington residents have the opportunity for safe, healthy, affordable homes in thriving communities. This document contains the complete list of our 2015 state legislative lead and support items. Click here for the black & white version of this document. Building affordable homes can be challenging in communities across Washington. The private, for-profit housing market builds market-rate developments with rents that are out of reach for lower income families and individuals. The state evens the field by creating safe, healthy, and affordable homes through capital budget investments. If a Medicaid Supportive Housing Services Benefit was created, then supportive housing providers could bill Medicaid for supportive services provided to eligible residents. This would allow more chronically homeless people to access services, improve the integration of behavioral & health care, and would help individuals with severe and chronic health issues stay off the street and live in a healthy home. Over 200,000 people live with disabilities and low incomes in Washington. Many struggle to keep their home and afford their basic needs. Some of these individuals have children in school depending on their stable job. Unfortunately for thousands of Washington families and individuals, a disability can often lead to homelessness. If you’ve ever repeatedly paid for the same costly tenant screening report in the search for a home, then you’ll understand the need for this legislation. The average renter will have to pay for three or more tenant screening reports when they are trying to find a new home. Currently, when a tenant is named in an eviction lawsuit, tenant screening companies merely state you were involved, and that’s it. The eviction could’ve been thrown out or the court could’ve ruled in favor of the tenant. But, none of this really matters because tenant reports list all eviction lawsuits as equal, even when the tenant wins. No matter the outcome, tenants have a mark on their record. In a home search, many vulnerable individuals and families face discrimination by landlords unwilling to rent to Housing Choice (Section 8) voucher holders. Also, seniors, veterans, and people with disabilities receiving other legal sources of income (e.g. government and nonprofit subsidies) face similar discrimination. 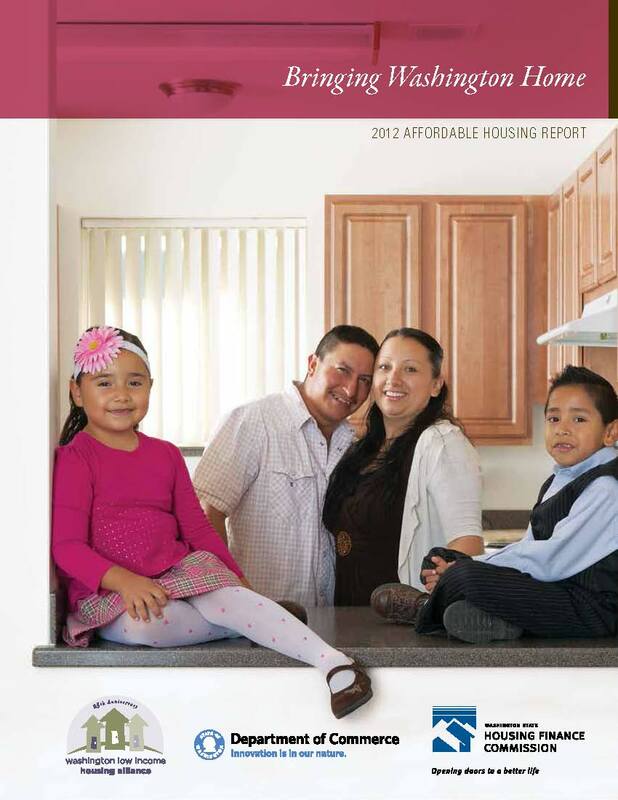 In this 2013-2014 Gratitude Report, we reflect on the progress we've made together over the last year to ensure that everyone has the opportunity to live in a safe, healthy, affordable home. We can only continue last year's successful momentum with your support. Please consider making a gift today. 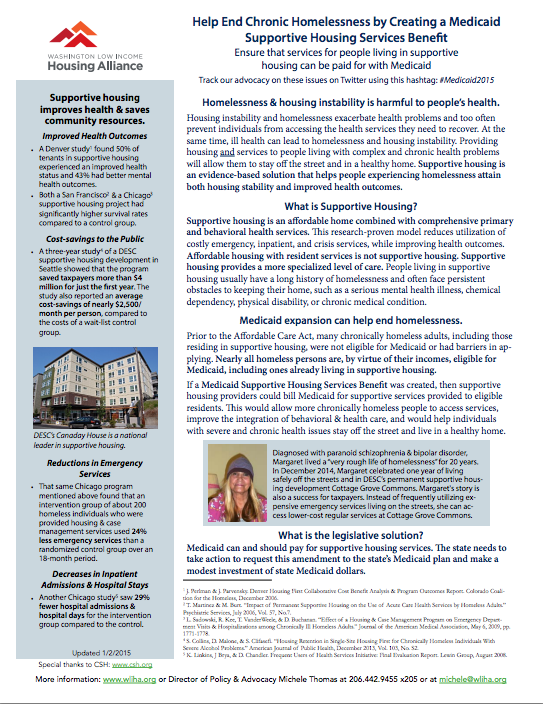 In partnership with CSH, we created this white paper detailing how Washington State can leverage Medicaid Expansion and the Affordable Care Act to end homelessness. In the white paper CSH lays out an easy-to-follow framework for states that want to create a Medicaid benefit to pay for the services in supportive housing. 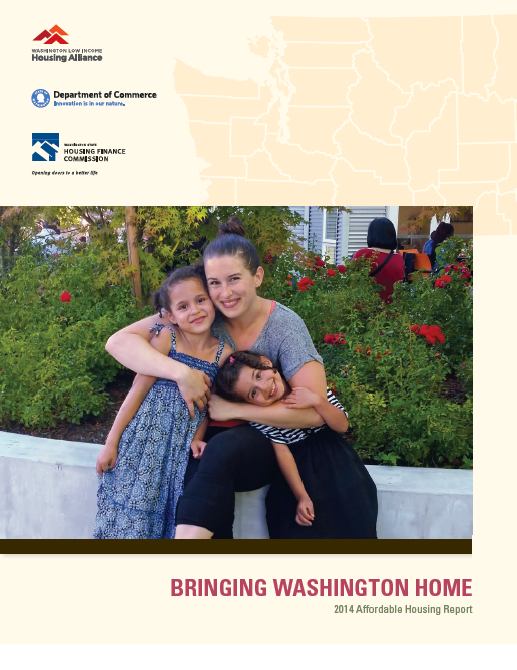 Each year, we partner with the Washington State Finance Commission and the Washington State Department of Commerce to publish this affordable housing report that has significant statistics and information on affordable housing and homelessness by county, by region, and across the state. 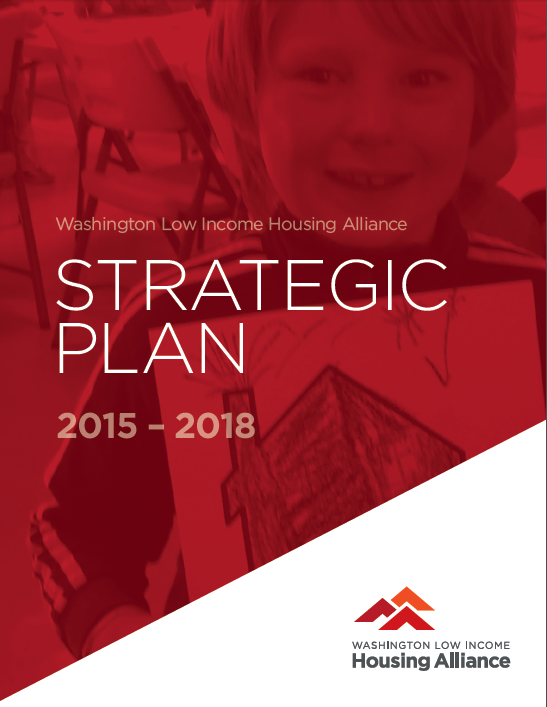 The Washington Low Income Housing Alliance advocates for public policy that furthers our vision of all Washington residents having the opportunity to live in safe, healthy, affordable homes in thriving communities. Our lead priorities for 2014 listed in this printable document. Building affordable homes can be challenging in communities across Washington. The private, for-profit housing market builds market-rate developments with rents that are out of reach for lower income families and individuals. 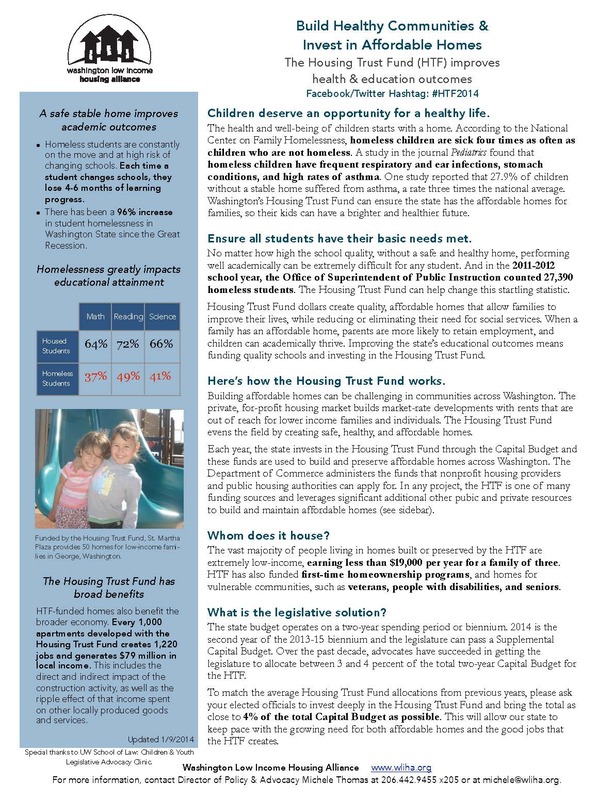 The Housing Trust Fund evens the field by creating safe, healthy, and affordable homes. Washington State uses modest recording fees on some real estate related documents as a significant source of funds for homelessness programs. These effective state and local programs help transition people off the streets into shelters and homes. However, these fees will undergo significant reductions in 2015 and 2017. 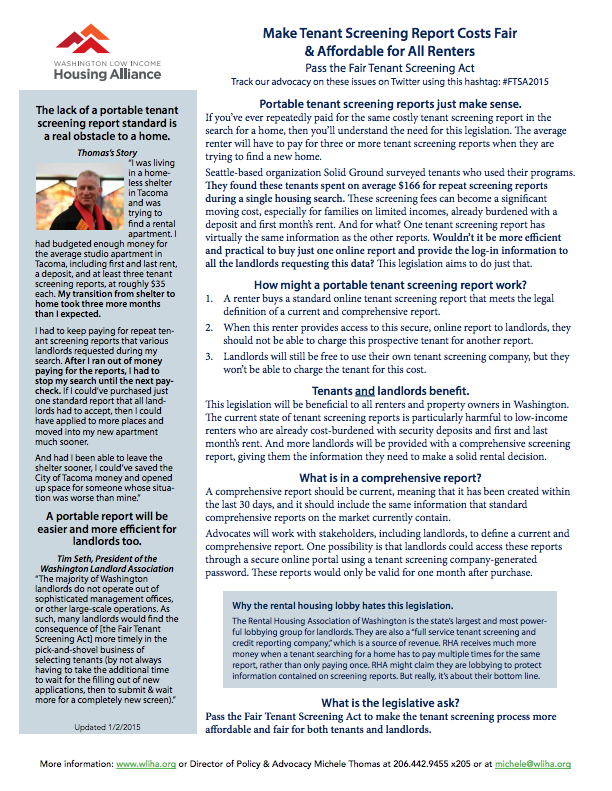 One tenant screening report has virtually the same information as the other reports. It is more efficient and practical to buy just one online report that all landlords could accept, rather than to have to keep buying the same report for different landlords in a rental search. The Housing and Essential Needs (HEN) and Aged, Blind & Disabled programs help ensure that mental and/or physical disabilities don't force people onto the streets. Whether by providing emergency rent & utility assistance or by providing a small cash grant, these programs are a lifeline for many of Washington's disabled residents. Providers can leverage the Affordable Care Act and Medicaid expansion to end homelessness across Washington State. If a Medicaid Supportive Housing Services Benefit was created, then supportive housing providers could bill Medicaid for supportive services provided to eligible residents. The National Housing Conference and Center for Housing Policy compiled this interactive report that allows you to compare the average income of a whole range of professions in a certain area to the amount of money needed to actually purchase a home or afford a 1- or 2-bedroom rental in that same area. The comparisons in each community are quite surprising. 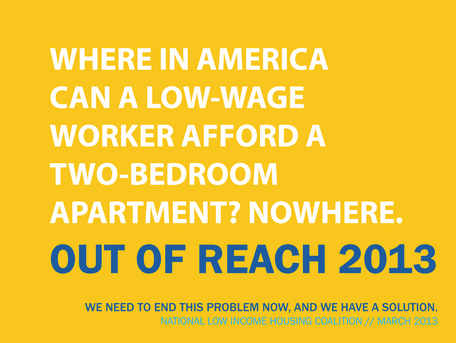 Out of Reach 2013 is a report jointly released by the National Low Income Housing Coalition and the Housing Alliance, providing housing affordability data for every state, metropolitan area, and county, including the Housing Wage. 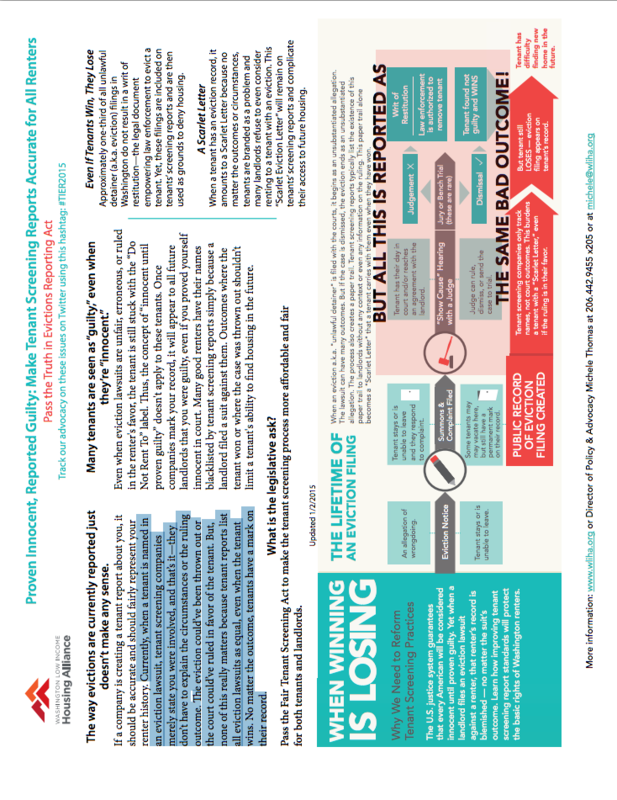 Housing Spotlight is a series of occasional research briefs from the National Low Income Housing Coalition that highlights a variety of housing issues. In 2011, in Washington State, for every 100 extremely low income households, there were 27 affordable and available units. 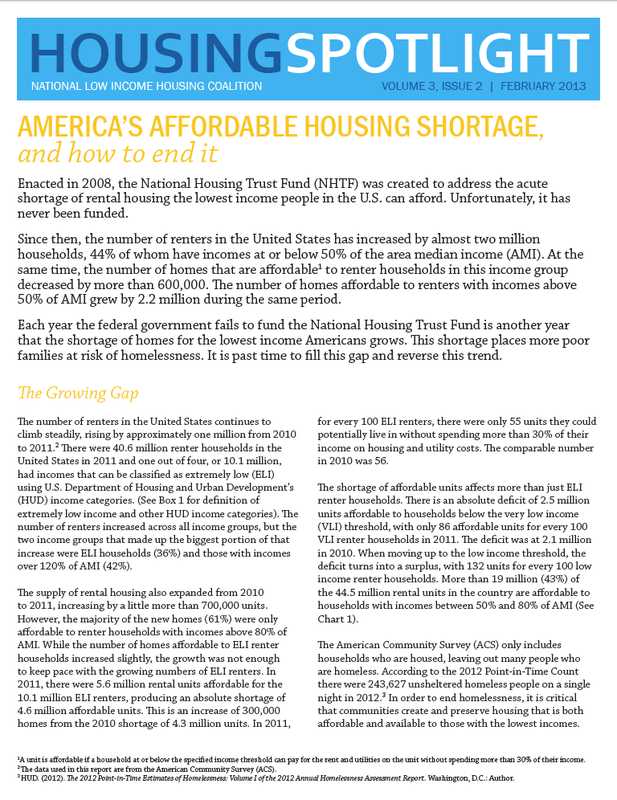 For every 100 very low-income households, there were 55 affordable and available units. 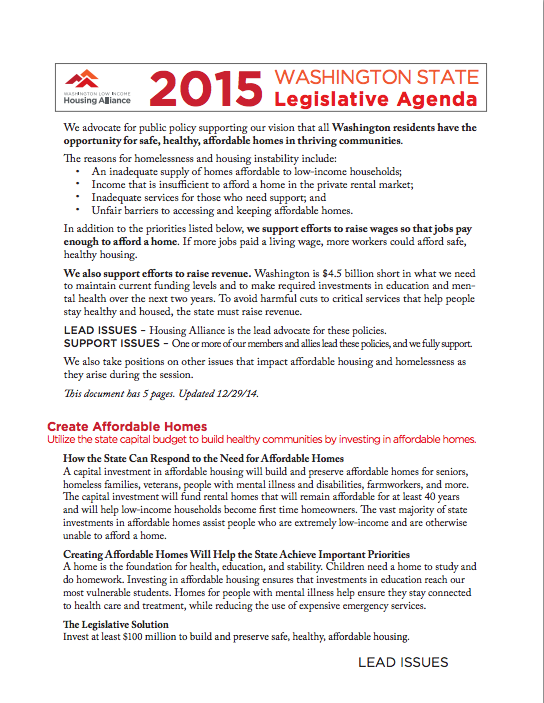 Want to learn more about the need for affordable housing across Washington State? 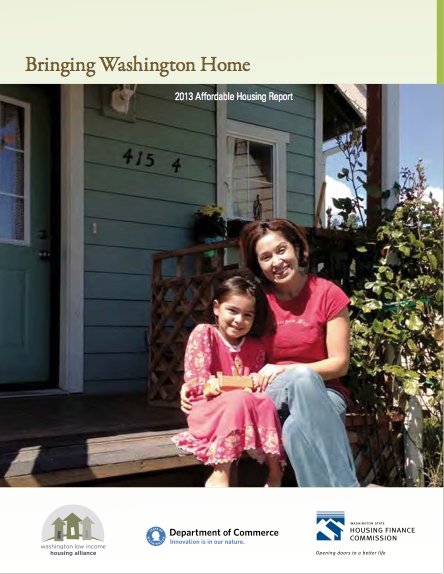 Download Bringing Washington Home: 2011 Affordable Housing Report. 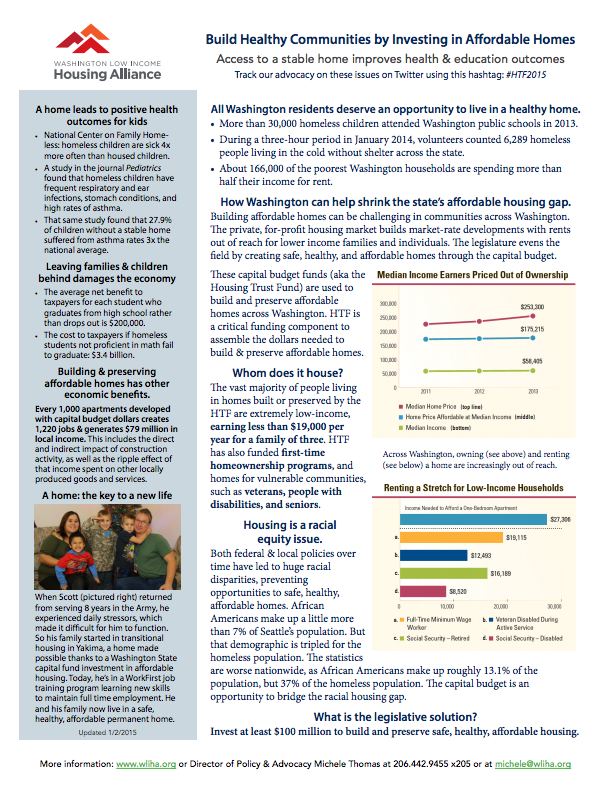 The Washington Low Income Housing Alliance advocates for policies and funding that make it possible for everyone in Washington to have the opportunity to live in a safe, healthy, affordable home. Lead Items are legislation and policy that the Housing Alliance directly advocates for. Our 2013 State Legislative Agenda also contains Support Items, which are legislation and policy that our members lead on and that we also support. 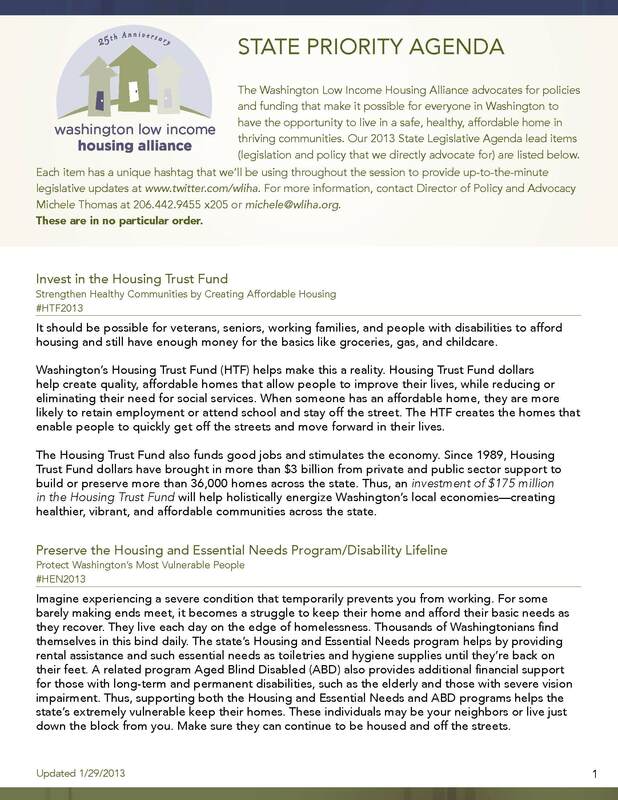 The Housing Trust Fund is Washington's best tool for ensuring access to safe, healthy and affordable housing. Since 1989, the Housing Trust Fund has successfully built, rehabilitated and preserved more than 36,000 healthy and affordable homes across the state. The Housing and Essential Needs (HEN) program helps ensure that temporary disabilities don't force people onto the streets, by providing emergency rent & utility assistance and by providing access to some of life's most basic household and sanitary needs. 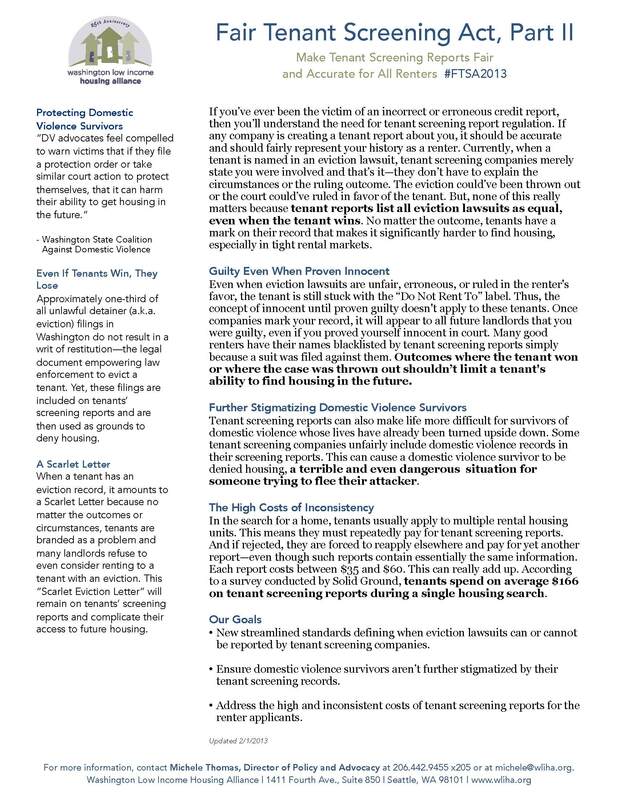 A tenant screening report is like a credit report for renters, and tenant screening is a fast growing, unregulated industry that greatly impacts access to housing. We must ensure any new Value Capture Finance tool is equitable, in that it supports ending homelessness and preventing gentrification and sprawl.